Note: I applied this polish on June 10th and took the photos on the 11th. My sissy loves Hot Topic and for my birthday in February, she got me 2 polishes from there. I was a little put off when I read that some of them contained lead. I couldn't find anything on the label or on the Hot Topic website about it so perhaps it was older polishes? I still wanted to give it a try. I mean they come in a cool skull shaped bottle! 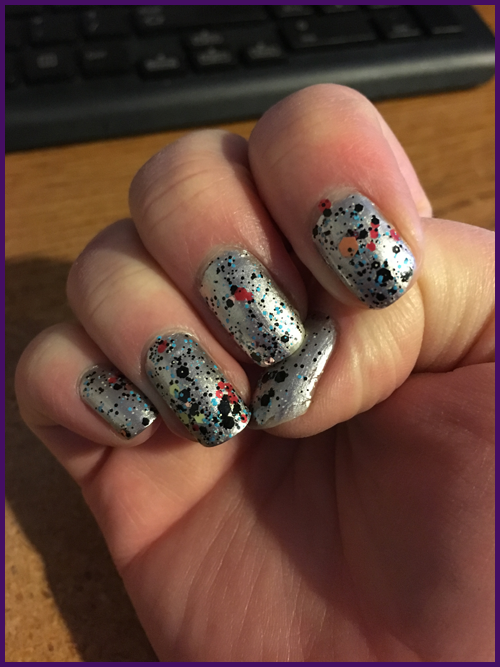 I was wearing Bobby Dazzler still from my previous mani so I decided to do another coat of that and try out the glitter to add some sparkle to it. I did just ONE coat and got SO much glitter coverage! The glitter in it is really unique. 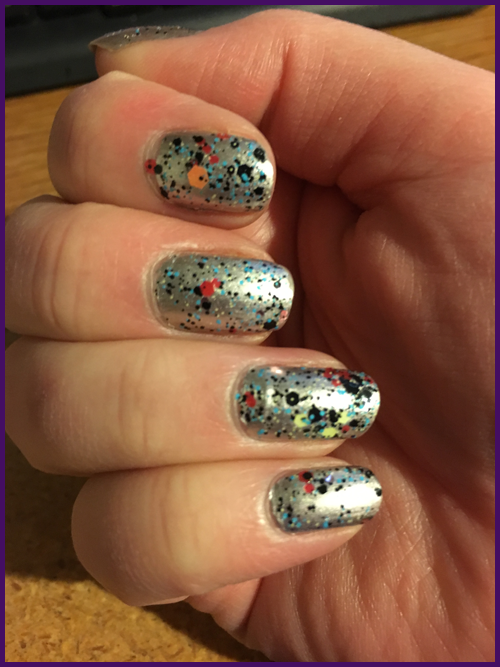 I know I have nothing similar to it in my collection nor have I seen anything like on various nail blogs I look at. The base is clear (it looks black in the bottle). There are different sizes and shapes of glitter. For the bigger hexes you get yellow, black, hot pink, and a peachy orange. For the smaller glitters you get black, yellow, and baby blue. In fact, I didn't notice the yellow until later when I was looking at it closely. The polish is really easy to work with especially when trying to spread out the bigger glitters. The formula is not as thick as I tend to find glitters with multiple glitters in them. It dried smooth and fast. I will definitely be trying this glitter with different colors. It looked good with the silver but as you can tell from the photos, it really reflects the light and it is hard to really see it with focus if that makes any sense. Overall I am giving this polish a 6 out of 6 stars. 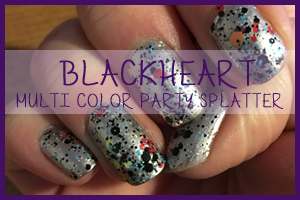 I love the random combo of colors and how well it dries!